Did you just bought AVG Antivirus and its failing to Install? Are you Getting 0xc00702e4 Error while running the installer to install the Program? If Yes, then just relax because you are at right place. We have couple of solutions to this issue. Full Error message might read as "Sorry, we've experienced a problem during initalization. Please try again. Error code: 0xC00702E4" Currently Users are getting this 0xc00702e4 error whenever they try to Install AVG. We did some research to learn why exactly users are getting it and how to get rid of the error. 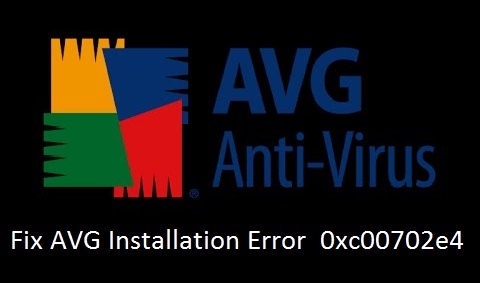 We Learned that Users are unable to install avg because of 0xc00702e4 error. This Error may occur because of two things 1) You already have Conflicting Programs Installed on your PC OR 2) Incomplete Installation Files. Installation files fails to execute and hence the error 0xc00702e4 on your screen. But We have 2 Methods that will help you to fix the error. Method 1: Use AVG Removal Tool. AVG have their own tool for completely removing their program from PC. This Removal tool does its job quite well. You will need to use this tool to completely remove AVG even the traces that are left. After Which you can Again download AVG and Install it on your PC. Step 1: Click Here to open AVG Download Center webpage, Then Scroll down and Download Avg Remover. Step 2: Run AVG Remover to Remove AVG Completely from your System. Step 3: Now Download AVG Again from Official Website. Step 4: Run the Exe File as Admin. Method 2: Uninstall Conflicting Programs. You may be shown this error because you already have other Antivirus Programs already. If you have Norton, Avast Etc then you will have to Uninstall them. So that Installation of AVG Antivirus can go through. If everything goes fine then, this time you should not get Error 0xc00702e4 while Installing AVG. Installation should go through and you should be able to use it without any issues. We hope that this would help you.